When the Lions sign free agents or even when they draft young guys they are always looking for leadership qualities. That means they’ve got a boatload of leaders in the locker room. In the complicated world of the NFL, you can never have too many. On Monday, the players voted on who would be team captains this year and on Tuesday the results were announced. None were a surprise. 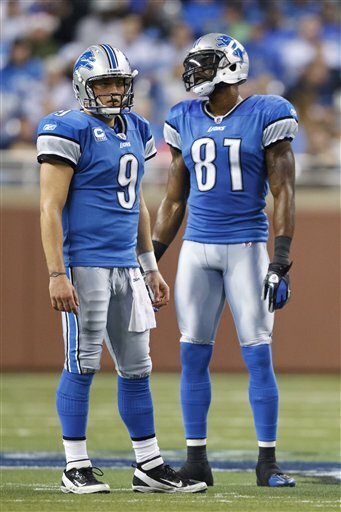 Matthew Stafford and Calvin Johnson are captains of the offense. It’s surprisingly the first recognition for Johnson. For Stafford, who is all of 24, it’s the third straight honor. On defense it’s Stephen Tulloch and Kyle Vanden Bosch. Again not a surprise. It’s third straight for Vanden Bosch with the Lions and sixth straight overall. It’s Tulloch’s first with the Lions and second overall. Jason Hanson, entering his 21st season, joins John Wendling as special teams captains. It’s a first for Wendling, who may start at free safety if Louis Delmas isn’t healthy. It’s the sixth straight for Hanson who will wear a gold “C” signifying four or more years as captain with the Lions. The other five captains will wear a team captain patch that includes a block “C” on the right shoulder of their game jerseys.